Preheat the oven to 450 degrees Fahrenheit. Bring the water and vegetable to a boil, then pour in the Manischewitz Matzo Meal and salt, and continue to cook and stir until the dough no longer sticks to pan. Remove from the fire, add unbeaten eggs one at a time, beating in each one thoroughly. Drop by tablespoonfuls on baking sheet lined with parchment paper. Bake for 25 minutes, then lower the oven to 325 degrees Fahrenheit for another 45 minutes, until crisp through. Allow to cool completely. In a stand mixer, beat together the heavy whipping cream and whip until stiff peaks form. Then add vanilla and powdered sugar, mix until combined. Microwave the peanut butter in a small bowl until it melts slightly then fold into the whipped cream, gently. Transfer the filling to a pastry bag fitted with a star tip. In a small saucepan, bring the heavy cream to a boil. Remove from the heat and pour over the chocolate chips. After 2 minutes, stir the mixture until fully combined. Set aside. Cut the pastries in half lengthwise. Pipe the filling onto the bottom half of each pastry and place the top half back on top. 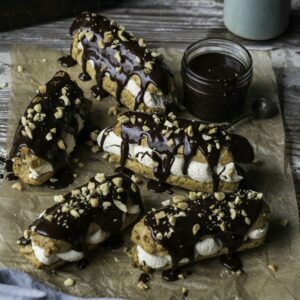 Place them down on a baking sheet lined with parchment paper and pour the warm chocolate ganache on top of the eclairs. Place the baking sheet into the fridge for at least an hour to solidify the chocolate ganache. Serve chilled.